London's marathon proved to be fast once again on Sunday. Sammy Wanjiru who won the gold medal in the marathon at the Beijing Olympics in August captured the win in London--and in course record time. With warmer weather starting to make an appearance, many would argue it's time to start thinking about prepping those bodies for lighter layers and beach season. Start shedding the pounds--up to 12 in two weeks--with this new workout from Prevention. Can sugar be to blame for the numbers stuck on your scale? 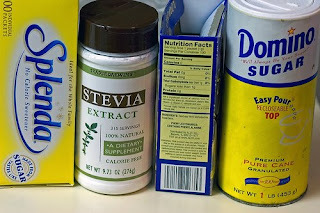 Joy Bauer takes a look at sugar substitutes like stevia, Splenda, and Equal and how they could be hurting more than helping your waistline. Check out this wild routine at Daily Candy. It's far more circus than it is exercise but it does promise to increase your balance, strength and coordination. For the shoppers out there--and to feed my own window-shopping eyes--Moosejaw has some new gear for spring and sale and clearance merchandise to stock up for winter's ugly return. Let's just hope we don't have to think about that any time soon and focus on the bright colors, tees and fun patterns.